The Honda Motor Company is founded. Soichiro Honda established Honda Motor Co., Ltd., on September 24, 1948, in Itaya-cho, Hamamatsu, with capital of 1 million yen. In October of the following year, Takeo Fujisawa, who became Soichiro Honda’s lifetime partner came aboard as managing director. The two aimed to build the company into the world’s top motorcycle maker. That goal was realized through the sale of the Super Cub C100 in August 1958, their participation in the Isle of Man TT Race in June 1959, and the opening of Suzuka Factory in April 1960. The twelve years during which they pursued their dream of becoming number one worldwide was an era of confusion and turmoil for both Honda Motor and the rest of the world. Let’s listen to the words of the people who along with Soichiro and Fujisawa lived their lives to the fullest amid the turbulence of that period, striving toward their dreams with creativity and a burning passion for success. The stories that illustrate the times reveal the “Hondaisms” that Honda and Fujisawa passed on to them. 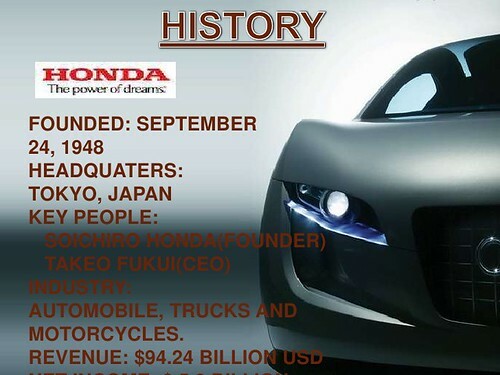 On this day, motorcycle builder Soichiro Honda incorporates the Honda Motor Company in Hamamatsu, Japan. In the 1960s, the company achieved worldwide fame for its motorcycles in the 1970s, it achieved worldwide fame for its affordable, fuel-efficient cars. Today, in large part because of its continued emphasis on affordability, efficiency and eco-friendliness the company is doing better than most. Before he founded the company that bore his name, Soichiro Honda was a drifter and a dreamer. He bounced from one mechanic’s job to another, and also worked as a babysitter, a race car driver and an amateur distiller. Even his wife said he was a “wizard at hardly working.” In 1946, he took over an old factory that lay mostly in ruins from wartime bombings, though he did not have much of a plan for what he would do there. First he tried building what he called a “rotary weaving machine”; next he tried to mass-produce frosted glass windows, then woven bamboo roof panels. Finally, after he came across a cache of surplus two-stroke motors, he had an idea: motorbikes. Honda adapted the motors to run on turpentine and affixed them to flimsy cycle frames built by workers at the Hamamatsu factory. The bikes sold like hotcakes to people desperate for a way to get around in postwar Japan, where there was virtually no gasoline and no real public transit. Soon enough, Honda had sold out of those old engines and was making his own. In 1947, the factory produced its first complete motorbike, the one-half horsepower A-Type. After the company’s incorporation, Honda produced a more sophisticated bike: the 1949 steel-framed, front- and rear-suspended D-Type that could go as fast as 50 miles per hour. At the end of the 1950s, it introduced the Cub, a Vespa clone that was especially popular with women and was the first Honda product to be sold in the United States. Starting in the 1960s, the company produced a few small cars and sporty racers, but it wasn’t until it introduced the Civic in 1973 that it really entered the auto market. The car’s CVCC engine burned less fuel and could pass American emissions tests without a catalytic converter; as a result, the car was a hit with American drivers frustrated by rising gasoline costs. The slightly larger, plusher 1976 Accord won even more fans, and in 1989 it became the most popular car in the United States. More recently, the customer base for Honda’s efficient, environmentally friendly cars has grown exponentially. Its tiny Fit car is selling well, and the company has plans to introduce a five-door hybrid model that will compete with Toyota’s Prius. Soichiro Honda was inducted into the Automotive Hall of Fame in 1989. He died two years later at the age of 84. The first nuclear-powered aircraft carrier, the USS Enterprise, is launched. A periodic Great White Spot is observed on Saturn for the first time. The Big Bang Theory first debuts on TV. 60 Minutes debuts for the first time on CBS. Gold prices drop after plot to control the market is foiled. The Prophet Muhammad completes his hijra from Mecca to Medina.